27. Peterson’s Own “Devil Anse” Shape? 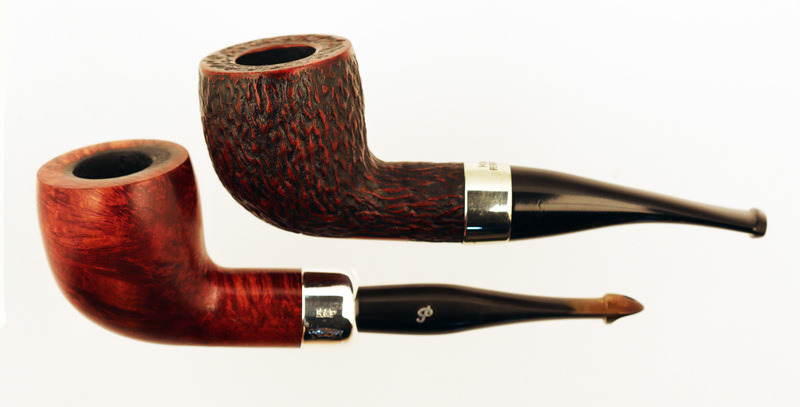 I have a deep passion for vintage pipe shapes, Kapp & Peterson’s in particular. Part of this is undoubtedly because so many original Peterson shapes are still being made. Part of it has to do with the mythic shift of time and culture which can concretely be held in one’s hands and smoked. It’s what Eric Squires calls “endurance”: “What I like, I’ve decided, is what endures, those things that keep surviving through time and wear, fashions and fads, exposure, accident, and hardship.”* I would call it rootedness, I suppose—benchmarks, touchstones, archetypes, glimpses into the really Deep Things. The 1904 Antique as released did not feature a P-Lip stem—an interesting anachronism which I will pass over—but is in fact the same size as the Large Jap AB when you lay it on top of the engraving (the catalog was printed at full 1 : 1 scale). The cant of the bowl is not as far forward on the reproduction pipe, and its walls are actually thicker than those illustrated. Both of these changes are probably to the benefit of the pipe. Its smaller bowl geometry of (approximately) 20mm wide by 40mm deep (0.80 x 1.59 in.) is what I think of as the Universal Ideal—you can get good results no matter what type of tobacco you prefer. And its thicker walls make for a chubbier look and a cooler touch. I found the fishtails somewhat uncomfortable, so I sent off and acquired P-Lip stems for my 1904/1908 set, which proved to be not only more comfortable but to smoke better as well, given the graduated bore and P-Lip smoke dispersal. As you can see by the oxidation on the stem of my Antique 1904, it gets a lot of use. After releasing the 2009 set of Antique Reproductions, Peterson still had a few of the Antique 1904 bowls from the 2005 set on hand, which were given the B23 shape number. A few were released in Mario Lubsinksi’s Italy-only Rock of Cashel line, but most of them were released under the Kapet line name. 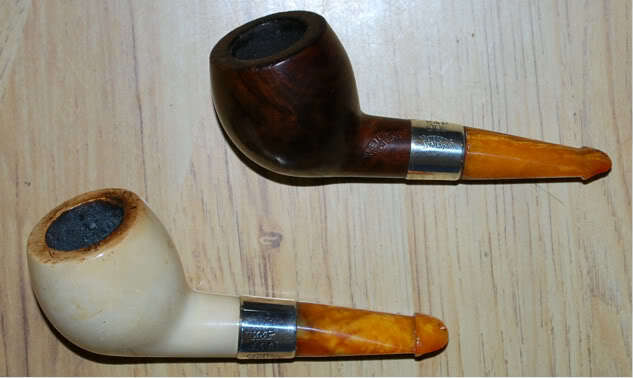 The Kapet has traditionally been an entry-grade line for Peterson, but as you can see in the two photos from Smokingpipes below, they were rusticated in an interesting and tactile manner and given a nice orange on black contrast stain. The B23 becomes a very different looking shape with the thick stem and tapered 1/8th bent mouthpiece than the traditional military-mount with straight P-Lip, but no less pleasing in its own way. There weren’t too many B23s released—Smokingpipes only got about half a dozen. I came close to getting one, but as I so often do I sat on the fence until it was too late and lost my chance. Recently a B23 Kapet came up on Ebay, unsmoked, but apparently stored under abysmal conditions. The stain had faded and the stem was oxidized in a peculiar manner. No odor or damage, just extreme fading. I asked Steve Laug for his advice on restoring my Kapet B23, and he suggested using a Sharpie to paint in the black underlying areas, then overstain the whole pipe. I tried a Sharpie, but mine made a silver/charcoal color and point was a little too thick to get into the crevices, so I switched over to the art pens I used for drawing the illustrations in Pipe Smoking in Middle Earth—they were small enough to get into the crevices, but “painted” black. I used a very diluted mixture of Fiebing’s orange (75%) and oxblood (25%), hoping to replicate the orange of the original Kapet, flaming it while wet to set the stain. As you can see in the photo, the hoped-for orange didn’t happen. It came out more or less dark red—but (at least) without any raspberry overtones. I also lost the hotfoil-stamped “P” in the stem, but that will almost always happen with a severely oxidated stem. You may recall the title of this blog referred to “Peterson’s own Devil Anse.” This is a shape that has fascinated me since I first saw one in real life in Rick Newcombe’s pipe bag at the 2013 Chicagoland Pipe Show. I don’t watch much TV so I had to be really crafty in asking him about the pipe without displaying my abysmal lack of pop culture (“Uh, nice-looking pipe…D’ja say that was a ‘Devil-whatsit?”). I was interested because not long before going to the show I’d seen an Ebay auction for a Peterson pipe that could have passed for Rick’s Devil Anse, but with an amber stem. I wish I had a picture of that auction, but at the time it didn’t seem all that important. I figured the shape would be a fad among those wealthy enough to ask an artisan to carve them one, then fade away as the memory of the mini-series faded. Apparently not. Smokingpipes recently commissioned Tom Eltang to make 15 of them for their 15th Anniversary, and it looks like they’ve sold all but three. 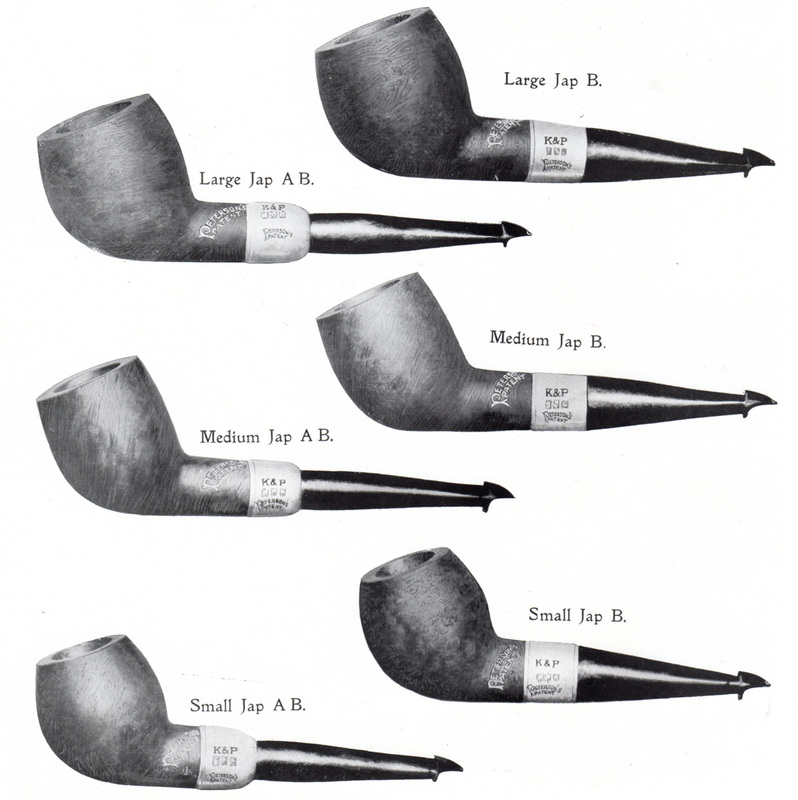 I’ve altered the angle of the Eltang pipe so you can compare it to the Peterson Small Jap from the 1906 catalog. The three Peterson “Jap” shapes are obviously related, but I don’t think they’re identical to each other, the smallest having a much more globular bowl than the others. You can see the similarity between the Costner / Eltang Devil Anse and the Peterson Small Jap more clearly in a photo Chuck Wright sent me—which has been on the internet for quite awhile—of a set he acquired from my co-author, Gary Malmberg a few years back. Chuck gave the set to Tom Palmer, CEO at Peterson, and it now resides in his office at Sallynoggin. I asked Palmer recently about the possibility of a Small Jap / Devil Anse reproduction. It turns out he actually has the original catalog page of the pipes framed and up on the wall behind his desk and said it was something Peterson would definitely consider for the future. Over the years I’ve seen four of my other Antique Reproduction dreams come to life, so I’m going to take Palmer’s words to heart. If you’d like to see a reproduction of the Peterson “Devil Anse” shape, you might drop them a line at sales@peterson.ie. 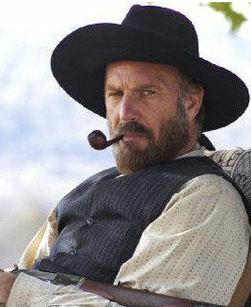 * Eric Squires, “The Old,” Smokingpipes.com newsletter, Thursday, July 9, 2015. Squires is onto something, but I haven’t had enough coffee this morning to remember what it is! Is it Henri Bergson’s simultaneity and duration or Paul Tillich’s eternal now or Flannery O’Connor’s understanding of the sacramental nature of reality? It is something most of us have experienced at the best and deepest moments of our lives, this sense of rootedness. You see it time and again in the supernatural novels of C. S. Lewis’s old pal, Charles Williams (1886-1945). http://s740.photobucket.com/albums/xx50/ChuckWright_01/Barry%20Levin/. After we get the Peterson book published, my next project will be finding a publisher to print a full-size, high-quality reproduction of this important work. I’m waiting for the Peterson pipe book to be in my hands to break in my Founders edition pipe. I couldn’t think of a better way to christen it. And I will definitely be jumping on the opportunity to buy a reproduction catalogue, it would be like a step back in time. Yours is quickly becoming one of my favorite blogs. Another fascinating shape from the annals of Peterson. One tip on Ebay – if you see a pipe/shape you want to retain, save it to “My Collection”. This must be done before the auction ends. (or save it to PDF). I would also be interested in that reproduction catalog.